Copyright = the right by creators to control their original works fixed in a tangible form. These could be print or electronic, creative or scholarly, articles or images. Copyright is automatic, so works do not need to be published or formally registered to belong to the creator. For a specific length of time, creators and designees possess the exclusive right to reproduce the work, make derivative works, distribute copies, and perform or display the work publicly. Significant exceptions apply. This guide explains. A strict but accurate interpretation of copyright law and fair use. From the Copyright Clearing Center. Consumer-friendly DIY legal guides to permission and fair use, plus copyrighting and licensing your own works. Look over this pamphlet introducing copyright, distributed by the U.S. Copyright Office. Understand how and when to use copyrighted material for purposes of criticism, education, and more. Read the full text of U.S. federal copyright laws in Title 17 of the U.S. Code, plus the copyright, patent, and trademark regulations in Title 37 of the U.S. Code of Federal Regulations. Read online or download the PDFs. Know Your Copyrights (2007) - Download an Association of Research Libraries brochure explaining copyright in the context of college teaching. This Copyright Guide from Brigham Young University librarian Carl Johnson offers thorough, in-depth coverage of all things copyright-related. Fair use = copyrighted material copied for a limited, "transformative" purpose: comment, criticism, parody, new interpretation, etc. Fair use does NOT require you to pay a fee or get permission from the rights holder. The American Library Association's handy Fair Use Evaluator tool will help you decide when use is fair. Still have unanswered questions? Try using Columbia University's Fair Use Checklist (PDF). The public domain contains creative works that are not protected under U.S. copyright law and free for anyone to use. Works usually enter the public domain because the copyright has expired or the rights holder didn't renew the copyright. Stanford University offers more information. Consult Peter Hirtle's useful chart illustrating Copyright and the Public Domain in the United States (2014). Why is the public domain valuable? Yale University Press, 2010. 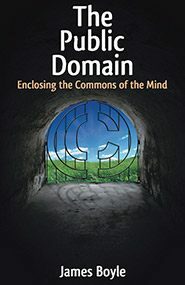 Influential open access book by James Boyle on the value of the public domain to innovation and culture. Material in the public domain can be used and shared freely.